The NYPD was held up for hours in intense negotiations yesterday with a man on the verge of leaping to his death from New York’s George Washington Bridge. Those at the scene report the situation took longer than normal to de-escalate thanks to the compelling, well-articulated pro-suicide arguments the man made to police negotiators. “I pulled up thinking this would be a routine jumper situation,” said on-duty officer Paul Ramirez. “I opened with the usual ‘you’ve got family that loves you’ thing and he told me his family all died in a plane crash. Man, he got us there. This guy was good. Real good.” Ramirez claims the rescue went well beyond what the academy had trained him for. The situation only resolved itself once discussion shifted away from the metaphysical. “What got him down was when I asked if he liked any TV shows,” said Officer Ramirez. 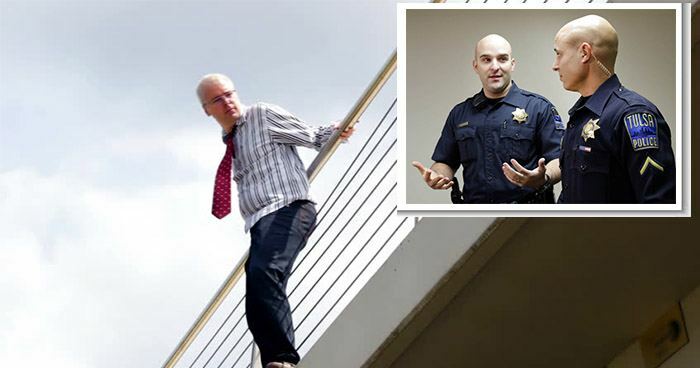 “It’s so nice to meet another Burn Notice fanatic.” In the end, reports say, police got him away from the ledge with the promise of Ramirez’s HBO Go password.